One of my favourite bloggers – from whom I learn a great deal – is Luixe who writes The Genealogy of Style. He is a prolific, thorough blogger who comments on modern art, literature, fashion, photography and music. He has recently been running a series of articles about Jean-Michel Basquiet, one of Andy Warhol’s collaborators. I have been attracted to his graffiti/social commentary/naive/African/disruptive art for years but didn’t know much about his life or death. Luixe’s posts arrived in my in box just at the point when I was considering my new block printing project. I thought about for printing using graphics, bold images and a limited colour palette. 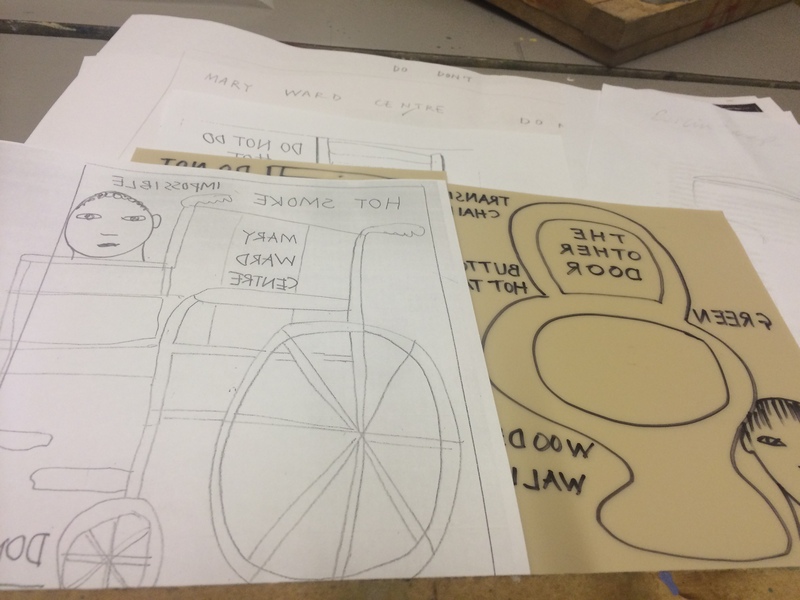 Using the theme of opposites we will generate designs which we can print. As a starting point please consider – Mechanical and organic or Old and New. There maybe a link between your opposites eg plane and butterfly, or they maybe completely different. You may want to consider opposites for different elements of the design small and large; light and heavy; pale and intense. You don’t have to include all these elements, they are just ways of helping you develop your ideas. By the end create a printed panel of fabric which can be made into a fashion accessory (eg purse); fine art – a panel or 3D object – consider where you would locate your artwork, or interior element (eg screen, throw, lighting). I started thinking about DO and DO NOT, especially in the context of my anger about the large number of negative notices at my college, which I have already posted. Starting with the idea of images of “things to sit on” in some of the notices – chairs, toilet, wheel chairs – I thought about including “messages” that were the opposite of the officious notices. I designed a new poster that encouraged creativity through a disruption of the prevailing “DO NOT” culture. A poster that would encourage students to “DO” interesting things in this essentially creative space. I also wanted to include the students in the posters, to show the object of the education in this building. Also by using lino, hand writing and simple drawings rather than regulation fonts and clip art I would be contrasting mechanical with organic. Also I wanted my images to at least reference the student – the organic part of the education process. Here is the drawing. Zoe reversed the picture on the photocopier so it was easier to transfer to the “Soft cut” material (a modern version of lino). I found it easier to draw it again using a black felt tip, and then cutting away the black lines. 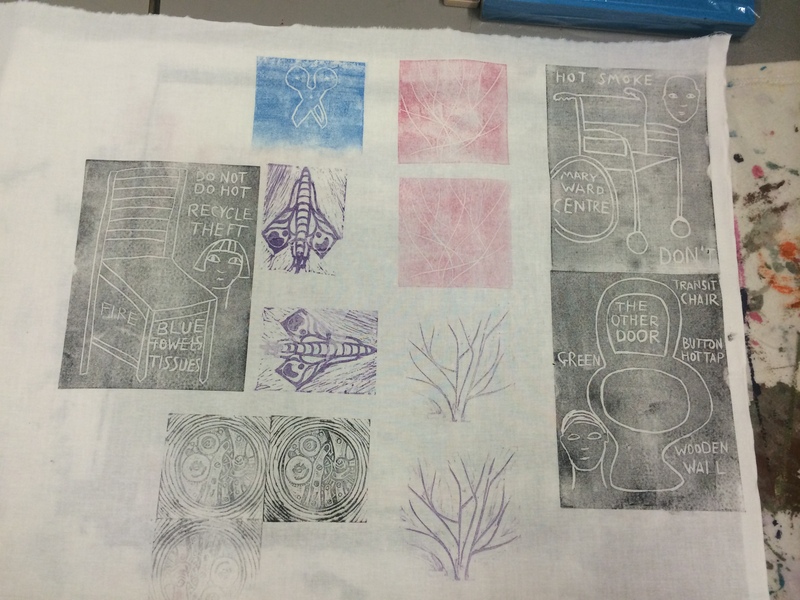 All the students were cutting out and used the same piece of cotton to test their lino on. We used fabric stamps for a change rather than getting all the inks, rollers, sponges etc out. It didn’t give me a very dense colour but I should be able to fix this next time. You can see the purple airoplane-butterfly that Diana has made. And bottom left is Nicks clock. He has also done a dandelion lino print. I will share the other students’ work in due course as it is very interesting. I will be working with these three images next week to create an art work. I need to find a way to introduce more colour, and I am currently thinking of machine embroidery. In anticipation I have ordered some machine embroidery thread. In terms of what to make from this I have up to now only produced fabric for garments. This time I think I will make a picture – something to hang up. Something with a message. Maybe two – one to hang up at home, and one to donate to the college. Using art to make change in the world is just very very cool! Fabulous idea! Thank you so much, Kate. 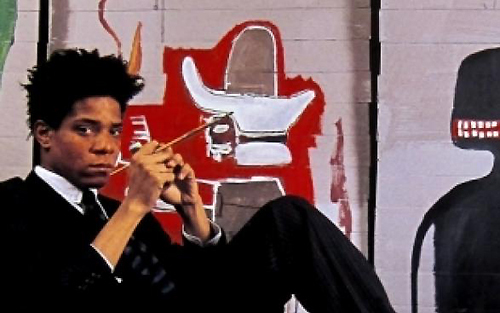 I love this post, since, you know, I adore Basquiat. He is so inspiring. Nice to be introduced to an interesting new blog – thanks!